Sister Catherine Kirwan-Avila made her first profession as a Handmaid of the Sacred Heart of Jesus on Saturday, January 14, in Wyncote, PA. The Mass was celebrated by Jesuit Father Daniel Joyce of St. Joseph University in Philadelphia. Deacon Kevin McCarthy of the Diocese of Springfield, MA served at the Mass and proclaimed the Gospel. 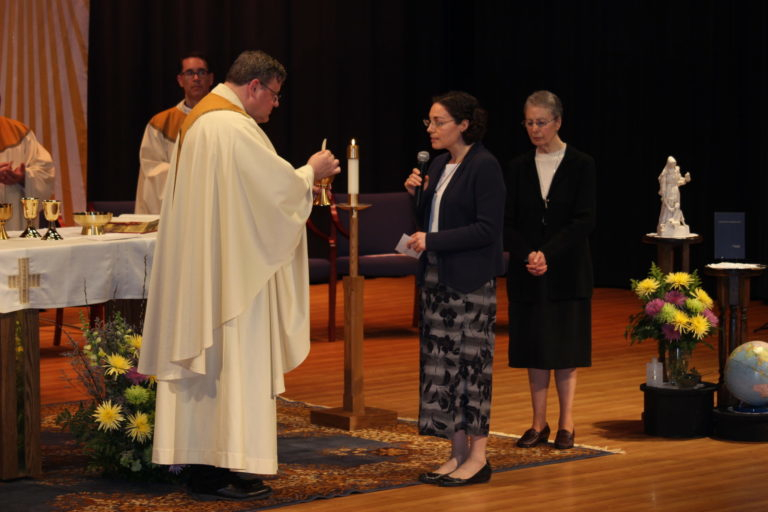 Deacon McCarthy taught Sister Catherine when she was in the 11th grade at Cathedral High School in Springfield. Along with the Handmaids of the Sacred Heart of Jesus, also attending were many people from western Massachusetts, including several high school classmates and many family members. Also attending was Gov. Tom Wolf of Pennsylvania. Sister Catherine said she was honored and humbled by the outpouring of love and support she received. She explained the vows ceremony, saying, “It occurs at the end of the novitiate. The novice consecrates herself to God by professing vows of chastity, poverty and obedience. This directs her whole life to the service and praise of God. “Handmaids have an extensive initial formation process which lasts about 10 years total, and we make temporary vows two times (sometimes three depending on the ministry of the sister) during that period,” she continued. “Each set of temporary vows last for three years. The vows formula is almost identical to that of the Jesuits and I think it ties together beautifully the acknowledgement of our desire to serve God, our human frailty and need of grace to do that, and our love and gratitude for God’s goodness. When asked to reflect on her vocation, Sister Catherine said, “I am very grateful for having been led to the Handmaids and am often struck by God’s gentleness, generosity and creativity all along the way. I too often forget and then am reminded again that God is the most resourceful and capable teacher, who understands his pupils totally and loves them boundlessly – no exceptions! Excerpts of this article first appeared in iobserve.org, the web site of Catholic Communications for the Diocese of Springfield, MA, authored by Peggy Weber.